Mr. P. has been hospitalized after having a heart attack. He also has terminal cancer for which he wants to continue treatment. If Mr. P. is admitted as an inpatient for a total of three days while in the hospital, he can qualify for Medicare Part A coverage of subsequent Skilled Nursing Facility (SNF) stay for up to 100 days. On the other hand, if the hospital does not classify three of his days of care as inpatient, he cannot qualify for a Part A-covered SNF stay. There are many reasons why it may be important for Mr. P. to follow his hospital stay with a SNF stay. Mr P.’s doctor might want him to regain strength and mobility with physical therapy and simultaneously receive treatment for his cancer. Many patients like Mr. P. could benefit from access to Part-A-covered SNF care in their final months of life. However, when hospitals classify some or all of their stay as “outpatient,” these patients will often not qualify for Medicare SNF coverage and may forego care. There is another advantage if Mr P. is able to receive Medicare-covered SNF care. While in the SNF, he would have the option to change from life-sustaining treatment to palliative care for his terminal illness under the Medicare hospice benefit. While receiving this palliative care, Mr. P could continue to receive the physical therapy prescribed by his doctor. If Medicare did not cover his SNF stay, he would not have access to this combination of care. One of the major advantages in receiving the Medicare hospice benefit at a SNF is that, unlike the Medicare hospice benefit, the Part-A covered SNF benefit covers the patient’s room and board costs. Qualifying for a Part A-covered SNF stay is important for hospice patients who wish to continue receiving a certain intensity of therapy or nursing services for conditions not related to their terminal condition. An Observation Status hospital patient who does not qualify for a Part-A covered post-acute SNF stay does not have access to these kinds of Medicare-covered services available at a SNF for conditions unrelated to their terminal condition. An Observation Status classification that keeps a Medicare patient from qualifying for Part A-covered SNF care leaves patients with enormous out-of-pocket costs. 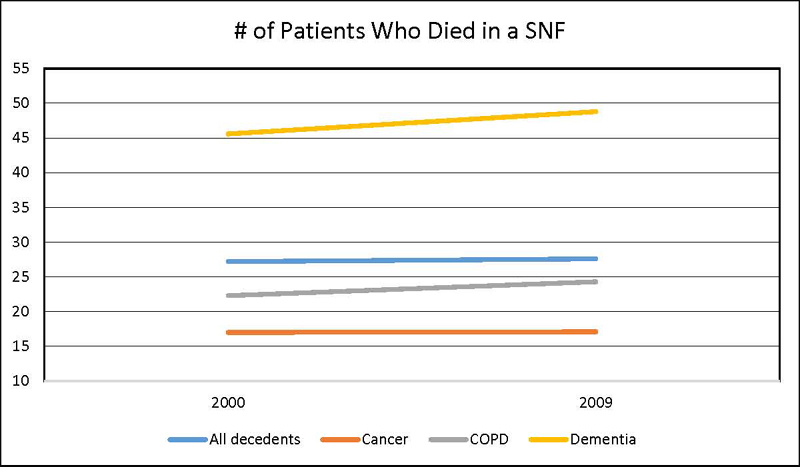 As a consequence, surviving families or loved ones can be left with expensive SNF bills after a terminal patient passes away. 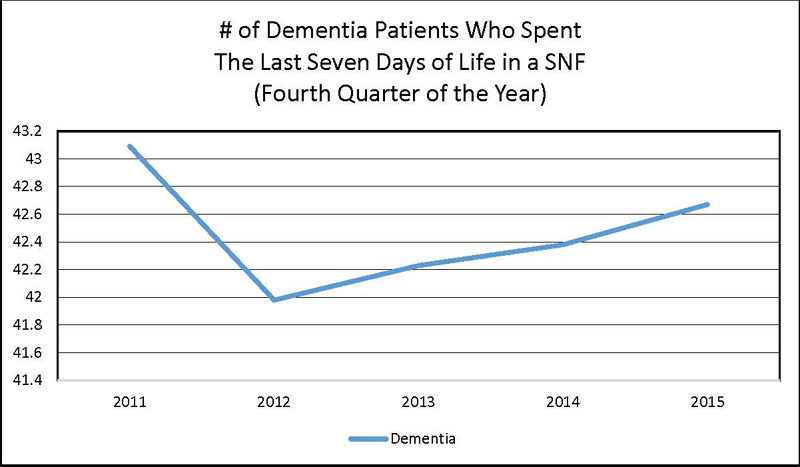 The graphs below highlight the increased numbers of terminally ill patients who spend their final weeks in a Skilled Nursing Facility. Almost all of the graphs are condition-specific for particular terminal diseases. 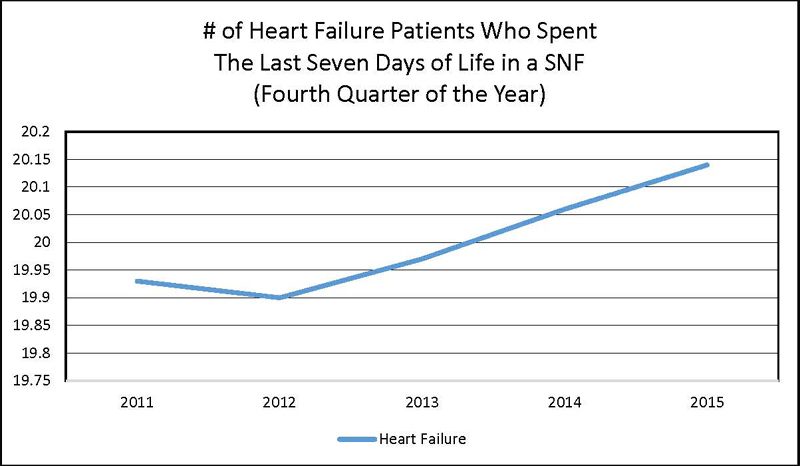 These graphs look at SNF utilization over time in either the patient’s last seven or 30 days of life. 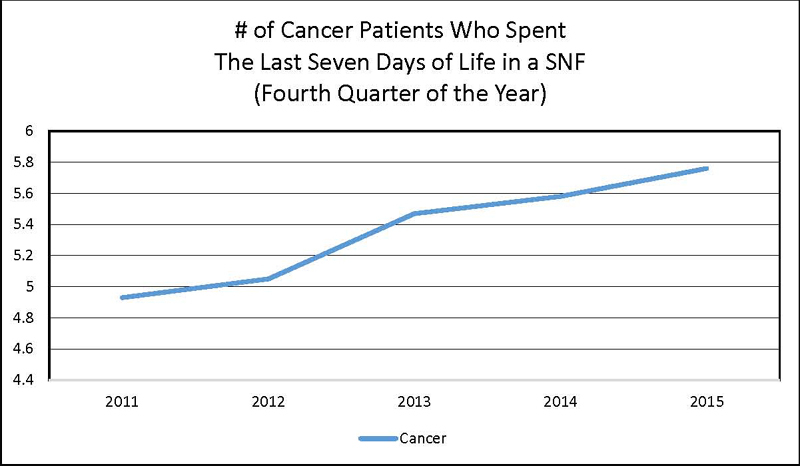 Finally, the last graph highlights SNF patients’ increasing utilization of pain medicine – one kind of palliative treatment – in the last five days of life. 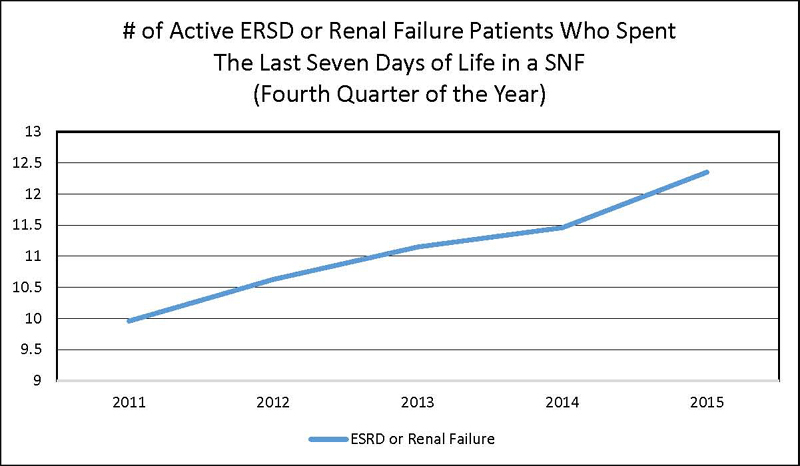 This last graph illustrates that more and more patients are spending their final days in Skilled Nursing Facilities. Hospital Observation Status has significant, harmful consequences for terminally ill Medicare beneficiaries who spend their final days in skilled nursing facilities. To remedy this harm, the Center for Medicare Advocacy reiterates its call for all days spent in the hospital to count toward the 3-day prior hospital stay requirement for Medicare SNF coverage. For the Medicare hospice program’s definition of “terminally ill” and a brief description of the elements of the Medicare hospice benefit, please see: 42 C.F.R. § 418.3. Most patients qualify for a Part-A covered SNF stay through the provision of certain amounts of skilled nursing or rehabilitation services. Patients can qualify for these services in the following ways: 1) they need rehabilitation five or more days a week, 2) they need skilled nursing seven days a week, or 3) they receive some combination of the two throughout all seven days of the week. See: 42 C.F.R. §§ 409.30 (basic requirements), 409.31 (skilled level of care requirement), and 409.34 (definition of “daily”). 42 C.F.R. § 409.34(a)(2); MBP Manual, Ch. 8, § 30.6, available at http://www.cms.gov/manuals/Downloads/bp102c08.pdf (site visited September 7, 2016). Sometimes the relationship between terminal illness and other comorbidities is not clear; this lack of clarity can make it difficult for patients to access care. In January 2016, Medicare launched the first of two phases of its Medicare Care Choices Model demonstration, a pairing of palliative and life-sustaining treatments for terminal Medicare beneficiaries. The demonstration does not rely on such a clear separation between terminal and other, possibly-related illnesses in order to determine whether a patient’s illness qualifies for palliative or life-sustaining treatments for their terminal illness. Patients in this demonstration qualify for both. For more information, see: https://innovation.cms.gov/initiatives/Medicare-care-Choices/ (site visited August 25, 2016). Joan M. Teno, Pedro L. Gozalo, Julie P. W. Bynum, Natalie E. Leland, et. al. 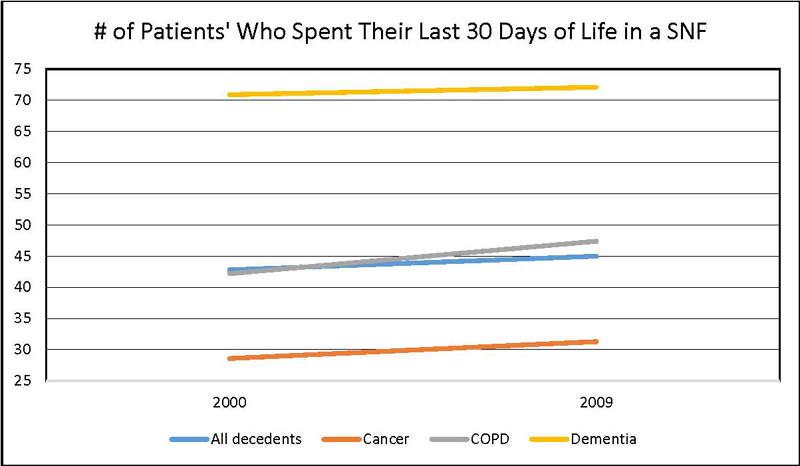 “Change in End-of-Life Care for Medicare Beneficiaries.” JAMA. 06 February 2013. 309:5. CMS. “Minimum Data Set 3.0 Public Reports.” https://www.cms.gov/Research-Statistics-Data-and-Systems/Computer-Data-and-Systems/Minimum-Data-Set-3-0-Public-Reports/index.html (site visited July 21, 2016). This data in the Minimum Data Set is only available in quarterly amounts. The Center felt that having 20 data points (four quarters for five years) along each horizontal access would make the data harder to read; the Center instead chose data from the last quarter of the year. CMS. “Minimum Data Set 3.0 Public Reports.” https://www.cms.gov/Research-Statistics-Data-and-Systems/Computer-Data-and-Systems/Minimum-Data-Set-3-0-Public-Reports/index.html (site visited July 21, 2016).